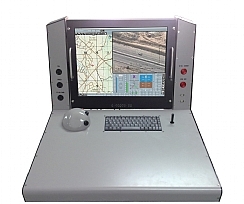 for vehicle operators, payload operators and mission commander, and a special dual channel real time controller for real time logic. The GCS is costum tailored to the costumer specific requirements, from a small highly portable GCS to a sheltered GCS, Innocon has the solution. The Naviator GCS is STANAG 4586 Level 5 compliant. • UAV’s for real-time surveillance, reconnaissance, target drones & smart weapons. • Unmanned ground, sea and underwater vehicles. • Real time controller for data link and GCS management. • UAV flight control and management. • Payload control and observation. • Mission planning on a digital map. • Special menus for UAV calibration and autopilot tuning. try synchronized flight recording and playback. • Data link and directional antenna tracking management. • Simulataneous multi air vehicle monitor and control capabilities. • Fully adaptable to any air, ground or sea vehicle system.